Couplers are an important consideration when buying N scale model railroad trains. You need to make sure the couplers on your locomotives and cars are compatible. In N scale model railroading there are two basic types of couplers: Rapido couplers and knuckle couplers. These two are not compatible. Rapido couplers are the original N scale couplers. The more recently introduced knuckle couplers come in a number of varieties, all of which are incompatible with Rapido couplers, and some of which may be incompatible with one or more other brands of knuckle coupler. 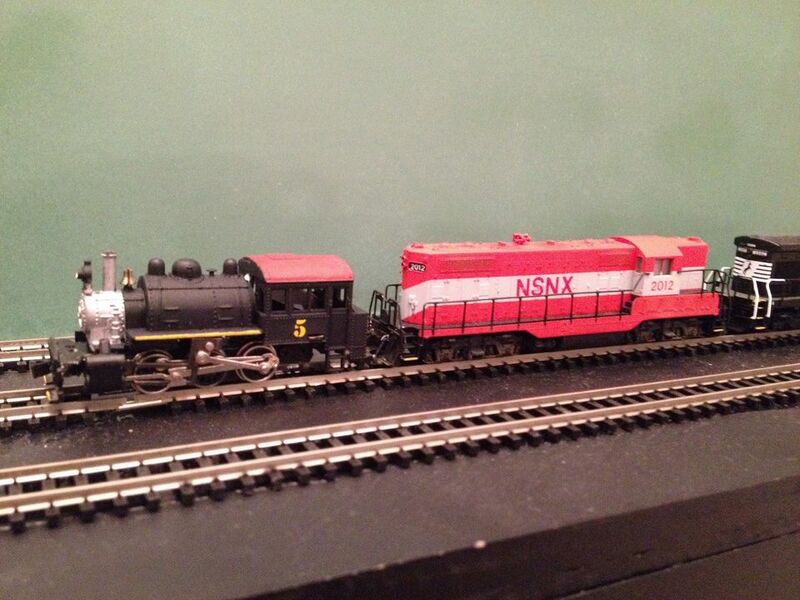 N scale was introduced in the early 1960s. Some sources claim that Arnold-Rapido were the originators of N scale, although apparently, Trix was working on products in this scale about the same time. What is evident is that Arnold-Rapido allowed other manufacturers to use their Rapido coupler design, making early N scale products coupler compatible. But Rapido couplers left much to be desired. Rapido couplers are sort of square hooks that don't look anything like real-life railroad car couplers. Also, Rapido couplers can only be decoupled by hand. Most N scale manufacturers today configure their products with some kind of knuckle coupler, but a few, particularly low-end brands, still ship their products with Rapido couplers. Kadee's Magne-Matic couplers in HO were the first couplers that could be decoupled by a magnet under the tracks, rather than by hand. The HO Kadee Magne-Matic couplers had been around since the 1940s. But in the early 1960s when Kadee introduced Magne-Matic couplers in N scale they may have been the first N scale knuckle couplers. Kadee later split into two divisions, and ultimately into two separate companies. All products in HO and larger scales continued to be manufactured by the original Kadee company. The new company Micro-Trains Line was created to manufacture all smaller-scale products. Today Magne-Matic couplers in N scale are commonly referred to as MTL couplers, and they are still among the most popular. As the Magne-Matic couplers are patented, and some companies didn't want to pay royalties to Kadee/MTL, other brands of knuckle couplers emerged. All knuckle couplers are intended to look more prototypical than Rapido couplers. Today Atlas offers their Unimate couplers and Kato, Intermountain Railway, Red Caboose, and Roundhouse each offer their own brands of knuckle coupler. Recently (at the time of this writing) Athearn Trains acquired HO coupler manufacturer McHenry, and they have expanded the McHenry line. They are now producing McHenry N scale couplers, which will be found on all their new N scale releases. In addition to all of these, Fleishmann offers a variation found primarily in Europe. If you have locomotives and cars with Rapido couplers, they can be upgraded to knuckle couplers. Many hobby stores carry replacement couplers and some will do the replacements for you. And they should already be familiar with the compatibility issues between brands. On most N scale passenger or freight cars, the couplers are mounted in the trucks. The easiest way to change out your couplers, albeit the most expensive, is to replace the trucks. MTL and others sell truck assemblies. To replace old trucks you simply pull the kingpin which holds the truck in place. To save money some people create "conversion cars", cars with one knuckle coupler and one Rapido coupler. Conversion cars let you mix coupler types in one train. As an option for their Morning Daylight passenger cars Kato has introduced a new variation on the knuckle coupler, the "kinematic" coupler. This is a coupler that pulls Kato's new passenger cars together to close the gap between them but allows the gap to expand as needed on curves. These couplers are not compatible with any other kind of knuckle coupler, and some modelers have expressed concern about the wear that might be caused due to the difficulty in decoupling them (they do not support magnetic decoupling). Some rivet counters seem to think that standard N scale knuckle couplers are too large to be prototypical. They like to use MTL Z scale knuckle couplers on the front of their locomotives and the rear of their observation cars and cabooses to replace their N scale ones. This makes the train look more prototypical as it approaches and departs.